Summary: Storm visits the Morlock Tunnels to honor the anniversary of the Morlock Massacre. She unexpectedly finds Gambit at the Morlock burial chamber. He claims that he read about the massacre in the X-Men’s files and wanted to pay his respects. Meanwhile, Graydon Creed appears on a talk show. Iceman’s father stands up in the audience and challenges Creed’s anti-mutant positions. At the mansion, Joseph interrupts Rogue in her sleep, telling her he’s discovered a possible solution to her inability to touch people. She tells him to leave until she gets dressed. Joseph grows tired of waiting and returns to her window to check on her. Gambit spots him and attacks, assuming the worst. The two fight until Rogue emerges and chastises them both. Elsewhere, Havok spies on J. Jonah Jameson. Continuity Notes: This is the first issue that suggests a connection between Gambit and the Morlock Massacre. It’s not exactly subtle, as the narrative caption claims that the words “ultimately responsible” linger in Gambit’s mind and evoke thoughts he “would rather not dwell upon just now”. This comes after months of speculation in Wizard’s letters page that Gambit had some role in the massacre (after it had been confirmed that Gambit had some past with Mr. Sinister, who ordered the attack). I sometimes wonder if the creators at this time took fan theories from Wizard and actually used them (the revelation that Cable is Cyclops’ son was preceded by months of speculation in Wizard). Bernard Chang apparently didn’t have a reference for the “feral” Wolverine, as he’s drawn normally here. Since Uncanny X-Men #325 also took place on the anniversary of the Morlock Massacre, this means that one year of real time has passed between those issues (only thirteen months separate their publication). Or maybe we’re supposed to view the Morlock Massacre’s anniversary the same way we view Christmas in the Marvel Universe. 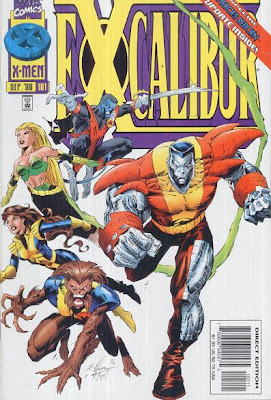 Review: I remember this as a dire era for this particular X-Men series. I barely recall anything about the stories; I just remember rotating fill-in artists and a never-ending series of time-killing filler plotlines. This issue doesn’t exactly prove me wrong. The strong hint that Gambit was involved in the Morlock Massacre gives the issue some significance, even though it’s another two years before an actual resolution is given. The rest of the issue consists of a pointless fight scene and a few brief setups for Uncanny X-Men’s storylines. The early Bernard Chang artwork is nice, even though he has a frustrating habit of giving his female characters the tiniest, skinniest necks I’ve ever seen (I realize this is an odd complaint, but it’s always bugged me). I didn’t care for his clean, cartoonish style when I first read this issue, but it’s aged well. 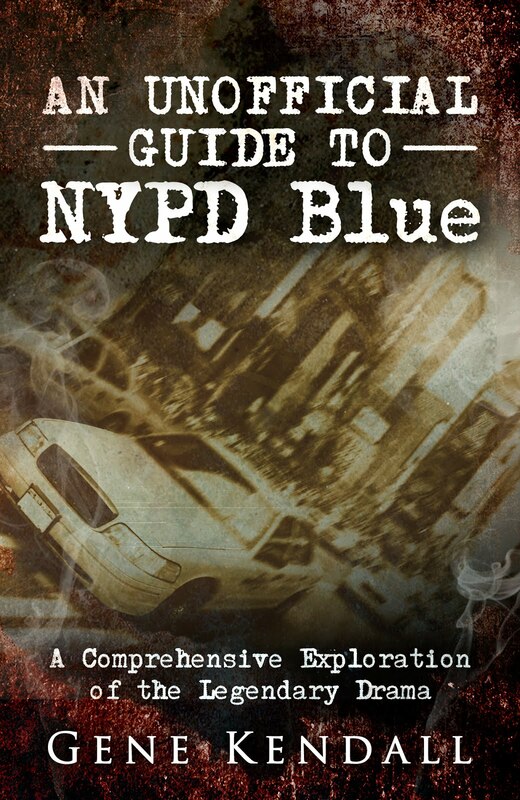 It bears no resemblance to the very ‘90s looking cover, thankfully. Ralph Macchio, who occasionally showed up as a fill-in writer on the X-books around this time, is credited as co-writer. I suspect he scripted the issue, as some of the speech patterns are off and the dialogue is much stiffer than Lobdell’s typical work. Marvel had developed a reputation over the years as a company that hired its own editors over actual freelancers as writers, which is something Bob Harras supposedly wanted to end. For some reason, Ralph Macchio (who was editing the Spider-titles at this point) would still randomly show up on the occasional issue like this for the next few years. It’s an extremely generic script, and I suspect it was written as a last minute fill-in. The most annoying aspect of the story is the sudden conversion of Iceman’s father. After Lobdell spent years portraying him as a comically exaggerated bigot, he’s suddenly taking a public stand for mutant rights. Given his previous characterization, an internal monologue explaining his radical change of mind probably would’ve felt forced, but it would at least be better than what we get here. His characterization is drastically changed with no explanation, and there’s no insight from Iceman outside of, “Way to go, Dad!” Complaining about a minor supportive cast member’s erratic characterization might seem excessively nitpicky, but it’s representative of the sloppy storytelling that’s emerged in this era. 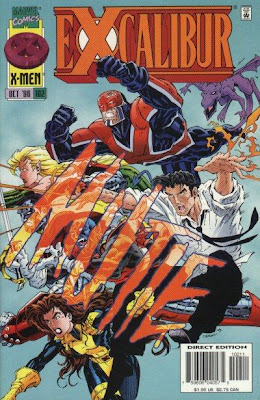 Summary: X-Force, Generation X, and the X-Men gather for an afternoon at the mansion. Their baseball game is interrupted by the arrival of a malfunctioning Sentinel. The teams unite and attack it, forcing the robot to fall on a series of power lines. The Sentinel screams in pain, which stuns the mutants. The dying Sentinel explains that it was created as an intelligence gatherer, and not a hunter/killer. When it was awakened by Onslaught, its super-computer began to develop a consciousness. After learning of Xavier’s surrender to the authorities, it came to warn the X-Men of the future it’s predicted. As the Sentinel dies, the assorted teams debate the merits of shooting it down. Caliban’s naive words calm everyone down, and they continue their party. That night, Cable and Phoenix unite their powers to give everyone a superficial mind-meld that bonds the teams. I Love the ‘90s: The Bullpen Bulletins page is bragging about Marvel going online for the first time. Their official site is actually www.onslaught.com, and exclusive content is also available through AOL with the keyword “Marvel”. Remember the days when having your own section of AOL was the equivalent of having an official site? Review: Combine a quiet post-crossover issue with typical annual filler, and this is what you get. The X-Men have fun, get bummed out by a Sentinel, then have some more fun. To close things out, they hold hands and feel good next to each other. The extremely cartoony art livens things up a bit, but nothing can disguise the dullness of the story. I have no idea what the point of the Sentinel’s appearance is supposed to be, since the X-Men forget about it very quickly and go back to their party. I reread the Sentinel’s dialogue several times, trying to decipher what exactly it’s supposed to be warning the X-Men about, but it’s too cryptic to tell. Apparently, it’s extrapolated that something horrible will happen now that Xavier’s in custody, but that’s a fairly generous reading on my part. The rest of the issue just touches base on some of the various character relationships of the time, without actually doing anything with them. Gambit is resentful of Joseph. Joseph flirts with Rogue. M acts snotty towards everyone. Everyone goofs on Cannonball. All of the scenes feel shallow, except for the brief scene that has Wolverine apologizing to Cable about his son’s death. Everything else in this issue is pretty bland. Summary: A young mutant named Trevor Chase is attacked by Friends of Humanity members. They claim that they learned about him through Raven, which is the civilian identity Mystique has used for two years while training Trevor. Elsewhere, the members of X-Factor are shackled and taken to a government building for a debriefing. Mystique escapes and goes to the hospital to visit Trevor. She then steals Trevor’s case file from the police and tracks down the local Friends of Humanity headquarters. She terrorizes the members and demands to know who ordered the attack on Trevor. Forge is excused from the debriefing and sent to find Mystique. He soon finds her by Trevor’s side at the hospital, where she privately declares that Graydon Creed will die. Continuity Notes: Trevor’s mutant ability is described as the power to “alter transpatial realities”. There are two shadowy figures in this issue. One is the government agent who is smoking a cigar and looking on as X-Factor is brought in for questioning. The other is Bastion, who is interrogating each member of X-Factor about Shard (whose existence the team is still trying to keep secret). After his identity is revealed, Val Cooper assures Bastion that he has her full cooperation. Review: I’m not sure what else I could say about X-Factor at this point. It’s not very good. This issue continues the “evil government forces conspire against the team” storyline, which has already gone too far, as the cast is shown shackled before they enter a debriefing. It’s absurd to think that any of the team members would stand for this in the first place, and Mackie puts no effort into showing how the cast feels about the incident anyway. Would any of these characters just shrug their shoulders and accept the fact that their superiors want to put them in chains for no reason? As for last issue’s cliffhanger that had the Dark Beast declaring that he would save the mortally wounded Polaris, it’s simply ignored. Polaris just declares that she’s okay and recovering nicely. The Dark Beast isn’t even seen or referenced in this issue. Fine then. Who needs issue-to-issue continuity? There is a nice idea here, as it’s revealed that Rogue isn’t the only young mutant Mystique has aided through the years. This makes sense, and it works well with her previous characterization. However, Mackie’s scripting is so awkward and clunky it’s hard to care about the boy, or buy into Mystique’s anger over his attack. Summary: Wolverine takes Elektra to Canada, where he makes his yearly visit to Silver Fox’s grave. Elektra responds by inviting Wolverine to visit her childhood home in Greece. Stavros the gardener tells Wolverine of a man he knew in the war, known only as “the Canadian”. The Canadian gave Stavros the dagger he used to avenge his mother’s murder by the Nazis. Stavros has held on to the blade for years. At dinner, Stavros tells Elektra that he’s located Sawyer, the surviving murderer of her father. Elektra tells Stavros that she’s not holding on to revenge, and asks him to spare Sawyer’s life. That night, Stavros goes to the wine cellar and frees Sawyer. He threatens to contact the authorities, but Wolverine intimidates him into keeping quiet. Later, while speaking to Elektra, Wolverine learns that Stavros is illiterate. Unbeknownst to Stavros, the name on his dagger reads “Cpl. Logan”. Continuity Notes: According to this issue, Elektra’s father had six killers. Two were killed by the mob after turning state’s evidence, two died in prison, and one died of a heroin overdose after his parole. Sawyer is the lone survivor. Review: We’re still in the “forced Elektra appearance” era of the title. Hama’s been able to make it work in previous issues, but it’s starting to wear thin. Judged on its own, this isn’t so bad, but the title’s gone six months at this point with only editorially mandated crossover and guest star stories. 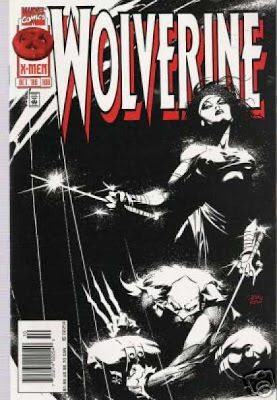 I like Hama’s treatment of Wolverine at Silver Fox’s grave, and revealing that Elektra doesn’t want to kill her father’s remaining murderer is a nice twist (I vaguely recall Bendis ignoring this story and just going the obvious revenge route in her later solo series). There’s barely anything else going on here. Revealing that Wolverine was “behind the scenes” of Stavros’ story in issue #102 doesn’t add anything to the original story, making it another case of Wolverine retroactively being involved in everything. It’s thankfully not a large part of the story, and I’m sure the gimmick hadn’t been done to death at the time, but it’s still slightly annoying. 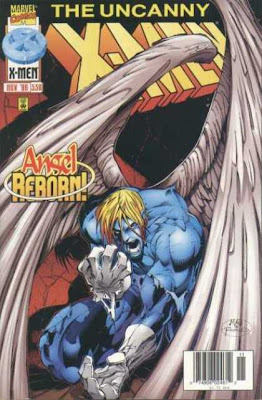 Summary: Archangel collapses in pain as his metal wings begin to molt and are replaced by feathers. Ozymandias appears and tells him that his original transformation under Apocalypse was only the beginning. Meanwhile, Joseph is shown a holographic recreation of Magneto in the Danger Room. He wonders why the X-Men would accept him on the team if he really was Magneto in the past. Psylocke teleports in through the shadows and tells the team that Archangel needs help. In Brooklyn, a sickly Pyro visits a church confessional. As a dazed Archangel arrives overhead, Pryo tries to warn the priest about an upcoming event. The X-Men track Archangel to the church, just as Pyro’s Legacy Virus infection causes his powers to go haywire. After Joseph subdues him, Pyro tries to warn the X-Men about “her” upcoming plan. Pyro is suddenly consumed by the earth, leading Wolverine to assume that Avalanche kidnapped him. Elsewhere, Iceman and Cannonball begin to work undercover at Graydon Creed’s presidential campaign. Continuity Notes: This is, obviously, the issue that ditched Archangel’s metal wings and revived his original ones. Psylocke’s “shadow teleportation” powers also appear for the first time. The only explanation is that the Crimson Dawn elixir must be responsible. Review: I remember hating this issue when it was released, and it hasn't improved with age. Aside from Madureria’s attractive artwork (I particularly like his rendition of Magneto versus the original X-Men in the Danger Room scene), there’s nothing notable about this issue. It’s filled with vague clues that ended up with little to no payoff, so it's hard to care. Why exactly would Apocalypse remove Archangel’s metal wings? If it’s because he no longer serves him, wouldn’t he have done that years ago? And why replace them with his original wings? There’s no internally justifiable reason; someone at Marvel just wanted his old wings back, I guess. If Marvel wanted a “back to basics” approach to the character, that’s understandable, but keeping his blue skin is an odd choice. If you’re returning Angel back to his original appearance, why not go all the way? Keeping his blue skin just seems like a halfhearted attempt to acknowledge an era of the character’s past that the creators obviously wanted to move away from by this time. Psylocke’s new, arbitrary powers are also frustrating. Supposedly, the shadow powers were added to have her stand out from the other X-Men telepaths. Making the character’s powers unique is admirable, but tacking random powers on to her while still maintaining her telepathic abilities seems pointless. It adds another wrinkle to a character that had already gone through too many alterations already. Morphing the proper British telepath into an Asian ninja should really be all of the distinction the character needs. She’s living in a stranger’s body, and now has to deal with her primal desire to physically attack opponents, even though her telepathy is the safer way to handle them. The earlier attempt to reveal that her personality had been merged with another character’s was misguided, but it didn’t last for long and it can easily be forgotten. Tacking on totally unrelated powers, and a mystical connection that’s altering her personality again, seems pointless. It makes her the cast member that the writers are always screwing with, leaving her as another X-character with the “too complicated” label. 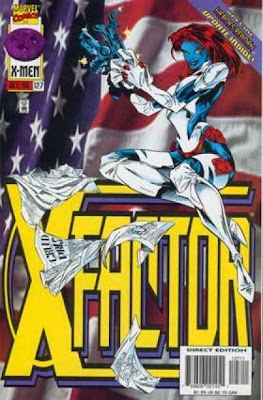 The actual story for this issue is a setup for the current X-Factor storyline, although there are no footnotes in this issue to lead you towards that title. The X-Men randomly come across Pyro, he makes a few cryptic comments, and then disappears. I believe this leads into the “Assassination of Graydon Creed” storyline, which was another story with a vague ending that went years without a resolution. And, of course, the disease Pyro is suffering from is another long-running storyline that was ignored for years before getting a quickie resolution. So, really, this isn’t a highlight of the era. Summary: Professor Xavier confirms with Cerebro that his powers are gone, and erases his records from the database. As Beast and Trish Tilby reconcile in Greenwich Village, Val Cooper arrives at the mansion. Cyclops, Bishop, and Wolverine assume that she’s there to arrest the Professor, and declare that it won’t happen. Storm, Phoenix, and Quicksilver argue that placing Xavier into custody is necessary to make sure that Onslaught never surfaces again. Professor Xaver emerges, and voluntarily agrees to go with Val. He tells the X-Men that he must be held accountable for his actions and says goodbye. Meanwhile, Bastion tries to intimidate J. Jonah Jameson into leaving Graydon Creed alone, but Jameson refuses to back down. Inside Archangel’s apartment, Psylocke discovers a feather on the floor. Production Note: The last three pages of this issue are clearly not drawn by Kubert, but no other credit is listed. It looks like Val Semeiks, or maybe Anthony Wynn's work (both were doing Wolverine issues around this time). Continuity Notes: The Psylocke scene is a precursor to next month’s Uncanny, which restores Archangel’s original wings. One brief scene amused me, as Cyclops asks Val if there’s information on his missing brother, Havok. A few years from now, when X-Factor is cancelled and Havok is believed dead, Cyclops never even notices it. It’s interesting that there’s at least some acknowledgment of the characters’ relationships with one another at this point, because the organic connections between characters will soon be neglected. Review: It’s another quiet, post-Onslaught issue. This issue tries to present a reasonable aftermath to the storyline, as Xavier is taken away by the government as a response to Onslaught’s attack. He’s not explicitly placed under arrest or handcuffed, which is another way Marvel tried to maintain the character’s dignity even during the Onslaught affair. Lobdell doesn’t go for any cheap fight scenes, as the characters get to act like grownups and just present their case to one another. In the end, Xavier makes a reasonable decision and agrees to leave. Looking back, Xavier’s departure is a little too understated, as this is the first time he’s been written out of the books since rejoining the team in 1991. Knowing now that he stays gone for over two years, with only a few sporadic appearances, it seems like this should’ve been a bigger deal (I suspect that Lobdell didn’t intend for him to be gone for so long). Over the years, writers have struggled with Xavier’s place in the titles, and it seems like a new justification is given every few years to write him out. The more recent efforts have pitted him against the team itself, which always struck me as forced and unnatural. This story isn’t particularly exciting, but it’s internally logical and leaves the character free to be used in future stories with little baggage. This isn’t a great issue, but the characters remain true to themselves and the story essentially accomplishes what it was supposed to do. Summary: The members of Excalibur reflect on the loss of the heroes during the Onslaught battle. Meanwhile, Colossus, Wolfsbane, and Amanda Sefton search for Margali Szardos at her home. The house is empty, but her maniacal laugh is in the air. Outside of a pub, Peter Wisdom and Kitty Pryde are attacked by representatives of the White House, who warn them to stay out of America. They take the leader of the group to Muir Island, and ship him off with the mutant criminals that Alistaire Stuart is taking into custody. A note attached to him says that he should be shipped back to the American embassy in a box. Continuity Notes: The name of Alistaire Stuart’s new government agency is called “The Department”. The mutant prisoners on Muir Island (apparently, there’s eleven, even though Spoor is the only one that’s appeared on-panel) are shipped to The Department, which now has authority over them. Review: Like last issue, this is mostly dedicated to having the cast react to the Onslaught event. Last issue, they were depressed that Xavier had turned into Onslaught. Now, they’re depressed about the apparent death of the non-mutant heroes, the rising anti-mutant sentiment in America, and Xavier’s inevitable arrest. Ellis handles the emotions well enough, there’s just barely anything else going on. The action comes from Peter Wisdom and Kitty Pryde fighting non-descript government agents for almost a third of the issue, and while Ellis plays it for laughs, it’s still pretty dull. The idea that the White House itself would send agents overseas just to tell some dirty mutants to stay out of America doesn’t work for me, because the only time the government has been shown to go after mutants indiscriminately is when rogue agents have been in charge. The government only officially sends Sentinels or troops after mutants accused of crimes, based on my recollection. The only time the federal government itself goes after all mutants is in dark, alternate futures, so Ellis’ treatment of the American government here seems mistaken (it reminds me of Mark Millar having the non-registered heroes arrested in Civil War, before the actual registration bill was passed). Aside from this complaint, there’s some nice character work in this issue, but it mainly feels as if Ellis is marking time until his last issue. Summary: In the aftermath of the Onslaught battle, Cable’s techno-organic virus has again consumed his body. Nathaniel Richards, the scientist father of Mr. Fantastic, tries to save his life. Cannonball, Domino, Storm, Caliban, and Franklin Richards watch anxiously as Cable’s condition deteriorates. Franklin declares that he will help Cable, and soon Cable’s astral form is reunited with his son Tyler. 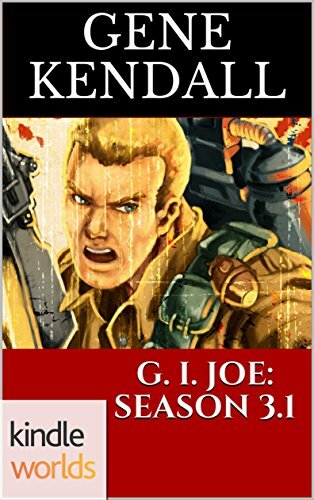 Tyler relieves Cable of his guilt over his death, and encourages him to pursue his destiny. After Nathaniel Richards gives Cable minutes to live, Franklin begins to cry. Cable’s spirit is then reunited with his late wife, Aliya. She encourages him to keep fighting before saying goodbye. In reality, Cable awakens and suppresses the virus, returning his body back to normal. Cable wonders if it was Franklin, or his internal resolution that saved him. Continuity Notes: Cannonball refers to Tyler as Cable’s adopted son, which confirms what had been long implied. I assume that Tyler wasn’t made a blood relative because Marvel didn’t want such a minor character to have the all-important Summers genes. According to this issue, Cable named him Tyler, so he presumably knew him at a young age. Review: This resolves the “Cable’s virus is out of control” storyline that had been running since the X-Man crossover. I never cared for the idea that Cable has to fight to keep the virus in check, mainly because the only drama it leads to usually involves Cable concentrating really hard and making pained faces. I understand that the virus exists in part to keep Cable’s powers at a reasonable level, but that doesn’t mean that stories about the virus itself are inherently interesting. This specific story tries to get around the “Cable tries really hard” resolution to his infection. Loeb instead goes with the inspirational dream route, as Cable is reunited with his late wife and son. Their conversations are a little cliché, but the sappiness is at least bearable. I believe this is the first time Tyler’s been presented in a sympathetic light, which is amusing since he’s already been killed off at this point. In retrospect, it’s strange that Marvel kept pushing these retconned aspects of Cable, even as his popularity continued to dwindle. Cable was initially a mysterious mutant with scarcely any powers who had to rely on guns to survive. Now he’s potentially the most powerful mutant on Earth, who has to fight a science fiction disease while fulfilling the destiny given to him by a quasi-religious order in the future. I personally find Cable’s characterization more tolerable during this period, but he’s clearly had a lot grafted on to him, and later writers have struggled with how to deal with it. Summary: Wolverine tries to reassure Professor Xavier, who is distraught in the wake of Onslaught’s destruction. Meanwhile, Bastion watches on as Graydon Creed makes a campaign stop in Central Park, where the heroes sacrificed themselves to stop Onslaught. J. Jonah Jameson is intrigued by Creed’s anger, and decides to look into his past. Bastion returns to his base, where his men are examining the Sentinels controlled by Onslaught. At the mansion, Phoenix comforts Quicksilver, who lost his wife and sister to Onslaught. The team gathers for breakfast, hoping that Xavier will join them. Wolverine enters, telling them that Xavier wants to be alone. The team tries to move on and continues with their meal. Continuity Notes: A narrative caption says that Bastion remembers, “staring into the eyes of his creator…and knowing fully…his reason for being”. One of Bastion’s aides is a shapechanger named Harper. Bastion slaps him for imitating his appearance and tells him to get back to work. I don’t recall if Harper appears again, or is given any type of an origin. I Love the ‘90s: Beast offers “a google thank yous” to Cyclops, which had a different meaning in those faraway days. There’s also an ad for the Crash Bandicoot video game that promises you a “free alternative music CD” if you preorder his Playstation game. That’s pretty ‘90s. Review: This is another quiet, talkative post-crossover issue. Xavier understandably receives much of the focus, as Lobdell pairs him with Wolverine for an extended conversation scene. These two character rarely interacted in this era, which is too bad since Lobdell seems to understand their relationship well. Wolverine’s changed the most since joining the X-Men, which proves that the example Xavier has set has merit (Although, judging by spoilers I’ve read online, it’s been revealed that Xavier mentally coerced Wolverine into changing. They really can’t let go of this, can they?). Lobdell doesn’t go for a pat ending, refusing to confirm if Wolverine’s talk with Xavier had any impact on him. It’s a well-written scene that actually works as a coda to the preceding storyline. Some of these post-crossover chats come across as excuses to kill time, but this is a scene that had to be done after the Onslaught story was over, and Wolverine is a good choice to act as Xavier’s foil and reassure him that his work has meaning. The remaining character moments are hit or miss. I don’t really care for the slapstick scene between Cyclops, Beast, and Iceman, but Gambit’s jealousy over Magneto’s second chance as Joseph is nicely conveyed. The scene with J. Jonah Jameson is an early attempt on Bob Harras’ part for a more integrated Marvel Universe, but it doesn’t go very far. The Bastion scene reads like the thousand other brief and cryptic subplots that have cropped up over the years, so it’s hard to care too much about it. Overall, this is one of the stronger quiet issues, and Madureira’s art is still nice (although the tiny head he gives Beast in one panel is even more egregious than some of Liefeld’s anatomy blunders). Summary: The X-Men rescue Professor Xavier from Onslaught, as the Avengers and Fantastic Four arrive as backup. Onslaught uses Franklin Richards’ reality warping power to create a second sun in the atmosphere, which puts greater pressure on the heroes to finish the fight. 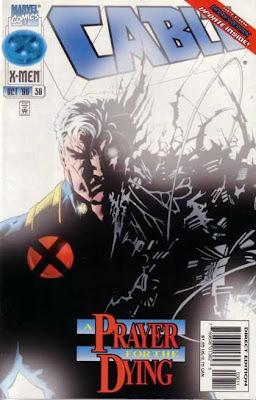 Cable telepathically enters Joseph’s mind and uses his magnetism powers to temporarily remove the barriers Onslaught placed on Xavier’s telepathy. Phoenix, at the Hulk’s request, turns off the Bruce Banner portion of the Hulk’s brain, allowing him to attack Onslaught with no self-control. The Hulk destroys Onslaught’s armor, which creates a large explosion that somehow physically separates Bruce Banner and the Hulk. Onslaught reemerges as pure psionic energy, which can now spread out across the planet. Thor volunteers to contain Onslaught’s energy in his own body, but he’s not enough. Members of the Avengers and Fantastic Four unite and enter Onslaught’s energy field. Mr. Fantastic warns mutants not to join the other heroes, claiming that their genetic pattern could give Onslaught more strength. Iron Man forces Dr. Doom to join the rest of the heroes, while Bruce Banner leaves the unconscious Hulk behind and follows the others. Mr. Fantastic gives word to the X-Men to destroy the energy field when all of the heroes are gone, as the mental images of Xavier and Joseph rescue X-Man and Franklin Richards. Onslaught is destroyed, but Xavier predicts that mutants will be blamed for the damage. I Love the ‘90s: Thing refers to Reed and Sue Richards as “Paul and Jaime”, a reference to ‘90s sitcom Mad about You. “Huh?” Moment: While inside Onslaught, X-Man has a conversation with a floating word balloon that’s not attached to anyone. Later on, we see him speaking to Xavier and Joseph, who are colored with a special effect. I’m assuming that there was a production error that prevented the pair from showing up in the earlier scene. Continuity Notes: Mr. Fantastic claims that the mutant Scarlet Witch can enter Onslaught because of her reality-warping hex power. Some fans complained about Falcon entering Onslaught, but as Kurt Busiek has often reminded fans, Falcon is not supposed to be a mutant, despite what a malfunctioning Sentinel once said. The heroes who enter Onslaught’s energy field go on to star in the “Heroes Reborn” titles. It’s later revealed that Franklin Richards created an alternate Earth when he came into contact with his mother as she passed through Onslaught. That world is represented by a blue ball, which suddenly appears next to Franklin after he’s rescued. Which heroes actually entered Onslaught was never kept consistent, and the fact that Franklin’s world was populated by millions of people, and not just these specific characters, means that he could’ve recreated whomever he wanted to anyway. For the record, we see Human Torch, the Thing, Wasp, Giant Man, Falcon, Namor, Captain America, Black Panther, Scarlet Witch, Crystal, Iron Man, Dr. Doom, Bruce Banner, Mr. Fantastic, and Invisible Woman enter on-panel. Remember the psionic armor that was brought up in several tie-in issues? The plot element that was used to justify Excalibur and Iron Man’s inclusion in the crossover? Would it shock you if I told you it plays no role in the final installment at all? X-Men Prime – A shadowy figure attacks Mystique, declaring, “It begins”. Forge speculates that whoever did this didn’t want to kill Mystique, but make a statement. This was originally supposed to be Onslaught, but someone changed their mind and the mystery villain became the X-Factor character Hound. Even in the context of later X-Factor issues, Hound’s actions don’t make a lot of sense, either. 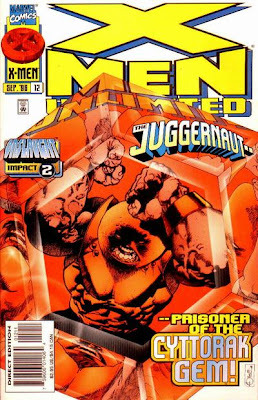 UXM #322 – Juggernaut lands in New Jersey, and claims he was punched in Canada by Onslaught. It’s later revealed that Onslaught attacked him because of Xavier’s resentment of his abusive stepbrother, which is fair enough. However, Onslaught isn’t supposed to have a corporeal form at this point; that happens after X-Man makes Xavier’s astral form physical in X-Man #10. Cable #21 – A shadowy figures steals data on Cable from Blaquesmith. Moira MacTaggert learns that someone (possibly the same person who leaked her Legacy Virus infection to the media) has been stealing her files on Cable, also. X-Men #44 – A powerful force is interfering with the psionic plane. This is later revealed to be X-Man, but the emergence of Onslaught could’ve also caused the disturbance. The X-Men’s Australian base has been used by another mystery figure, who is never revealed. I’m sure this was supposed to be another Onslaught hint, but it’s hard to say given the number of mysteries dominating the titles at this point. X-Force #46 – A mystery man kidnaps Mimic behind the scenes. It’s confirmed that Onslaught did abduct him, but Mimic drops out of the storyline very quickly with no explanation. X-Force #47 – Cable accuses Xavier of hiding information from X-Force regarding a mission, which he denies. This could work as an Onslaught hint, especially since their mission involved Mimic. However, it’s not portrayed as a shocking revelation, and nothing in the story infers that Xavier is lying. Wolverine #93 – Two Landau, Luckman, and Lake agents send Juggernaut to another dimension because he “knows too much”. This was probably meant as a reference to Onslaught, yet L, L, & L end up playing no role in the storyline. 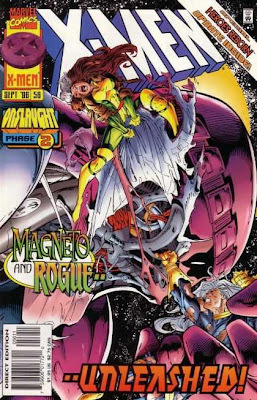 X-Men #46 – Onslaught kidnaps fifteen scientists working on a Sentinel project. Since Onslaught does use Sentinels later on, this at least makes sense. It’s important to Senator Kelly that a scientist named Evan Donner is missing, but this goes nowhere. X-Men #48 – Xavier begins to shut his feelings off after Sabretooth nearly kills Psylocke. Xavier’s disappointment over failing to help Sabretooth is later used to help justify Onslaught’s creation (which doesn’t explain why Onslaught was active before this happened). X-Men #49 – Onslaught kidnaps Chamber, for still unknown reasons. X-Men #50 – The strongest indication that Xavier wasn’t originally supposed to be Onslaught. Onslaught uses Gateway to kidnap four X-Men so that he can observe them. How much more information on the X-Men could Xavier possibly have? Other nonsense from this issue includes Gateway trying to abduct Xavier for Onslaught, the implication that a strange landscape is the source of Onslaught’s power, and Onslaught’s claim that he’s preparing the X-Men for “the coming”. X-Force #52 – Blob, whose powers have been enhanced by Onslaught, is sent to steal Nimrod technology. This is another Sentinel connection, although Nimrod is supposed to be a highly advanced Sentinel, and he never shows up in the storyline (although Nimrod prototypes do attack Cable a few months later when he revisits this base). Blob and Mimic are soon forgotten as the crossover begins. UXM #331 – Archangel questions if Xavier would use his powers in unethical ways, which looks like a hint that the creators were at least considering him as an Onslaught candidate at this point. Cyclops revisits the location Gateway took the X-Men to in X-Men #50. He’s shocked that there’s no debris, and the landscape doesn’t match its previous appearance. Never explained. 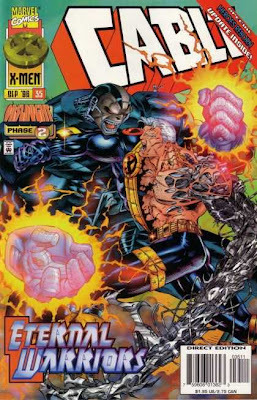 Cable #31 – It’s inferred that Onslaught is the one who stole Blaquesmith’s data on Cable in Cable #21 (originally, a silhouette of the X-Cutioner was shown to be the culprit). Whatever information Onslaught wanted is never revealed, and Xavier/Onslaught would presumably have all of the information he needs on Cable already. UXM #332 – Xavier threatens Zoe Culloden in order to get information on the missing Wolverine. The story hints that Xavier’s beginning to break from the strain of recent months, which works as a clue. UXM #333 – The creators have now firmly cast Xavier as Onslaught, as he begins to act irritable and snarky around the X-Men, which sets up next month’s revelation. The story also claims that Onslaught abducted thirty-one scientists, which more than doubles the number listed in X-Men #46. 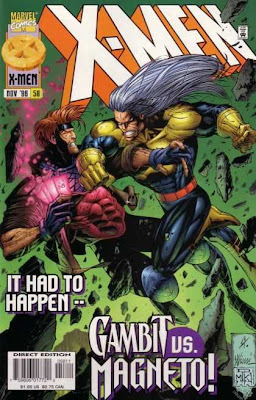 This issue has a June 1996 cover date, which means that as recently as May’s Cable #31, actions were ascribed to Onslaught that make no sense given his true identity. As for the story itself, there are a few nice exchanges between the characters as they say goodbye, but the action scenes are disappointing. The heroes spend a lot of time ganging up on forcefields and bubbly energy patterns, but none of the characters are really able to use their powers in distinctive ways. Onslaught remains a generic “destroy everything” villain, who can do nonsense such as creating a new sun. This adds nothing to the story, and it seems like the heroes quickly forget about it as soon as it appears (I guess it’s supposed to be the source of the wind that constantly surrounds the characters, but it’s not clear). I assume the scene was used as foreshadowing, to show that Franklin’s powers can create planet-sized bodies. Marvel’s editors had already decided that Franklin would be the means of returning the characters to the Marvel Universe when “Heroes Reborn” was over, which was at least some level of future planning. Even so, in this issue it’s a strange plot development that goes nowhere. As the conclusion to a storyline that had been building for over a year, this is undoubtedly a disappointment. Almost none of the clues leading up to the villain’s reveal match up, and characters who where supposed to be Onslaught’s faithful servants have disappeared by the time the event begins. At the very least, Mimic and Blob could’ve replaced the omnipresent Sentinels in any of the numerous tie-ins. The Punisher fighting the Blob could’ve been fun; instead we got an issue that barely used the Sentinels as the setup for an unrelated story. There’s a sense of half-heartedness surrounding the entire event, which is the exact opposite feeling the Age of Apocalypse storyline evoked. AoA managed to create an entirely new world, keep a remarkable amount of consistency amongst the various titles, and actually have a point outside of shock value. 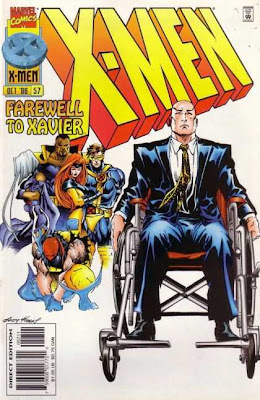 Charles Xavier’s importance to the world was demonstrated by showing what would’ve happened without him, which is a legitimate premise for a long-term storyline involving a large cast of characters. Now, Xavier has been turned into a villain because of the events of an unrelated storyline published three years earlier. He becomes the most powerful threat the Marvel Universe has ever known, and then proceeds to do absolutely nothing over the course of a dozen titles. He’s never given a plan or a motive, until the very end of the storyline when he just decides to kill everybody. It doesn’t make anything resembling a statement about the character, and Onslaught never even becomes an interesting opponent for the heroes to fight. The initial tie-ins got some material out of the heroes’ response to the events, but after that the characters do nothing except fight Sentinels, chat with each other, and develop futile plans for stopping Onslaught. Like so many other crossovers, it just becomes a waste of time. With Avengers, Fantastic Four, Iron Man, and Captain America licensed outside of Marvel’s offices for over a year, a new status quo was created within the Marvel Universe. Marvel could’ve pretended that the Lee/Liefeld books were still in the Marvel Universe and just ignored any continuity problems, but I suspect this was unthinkable at the time. An entire storyline had to be created to explain where the heroes have gone (one which unfortunately cannibalized an existing X-subplot and made it even more nonsensical), and the characters Marvel still controlled had to react to the loss. This did create an interesting new scenario, where more obscure heroes had to take the place of the missing icons, as mutant heroes where blamed for the heroes’ deaths. I seem to recall Marvel getting some mileage out of this, although it’s clearly a case of making the best of a bad situation. “Heroes Reborn” became a commercial success, as much as that could be judged in the post-boom period of comics sells. Critics hated most of the titles, but the stunt was successful in renewing interest in characters that Marvel has been neglecting for years. The story that went around at the time was that losing so many of their characters embarrassed Marvel’s employees, and inspired them to try harder when the rights reverted to them in 1997. This lead to some of the X-artists being assigned to more traditional titles like Fantastic Four and Captain America, while Silver Age revivalists such as Kurt Busiek and Mark Waid were hired to do new stories that also brought the characters back to their roots. Rather than making the Avengers more like the X-Men, the goal now was to make readers realize what made the Avengers cool in the first place. In some ways, the post-“Heroes Reborn” era began the X-line’s descent as the industry’s dominant commercial force. The biggest artists weren’t automatically assigned to the X-books, which sent a message to readers that Thor could be just as important to Marvel as X-Men. Soon, second-string titles like Daredevil were getting high-profile relaunches (as part of a deal with Joe Quesada’s Event Comics, which resembled the “Heroes Reborn” deal but didn’t place the characters in another reality) and rivaling the X-titles in sales. The success of Quesada’s relaunches (and, allegedly, anger over editorial’s inability to capitalize on the success of the first X-Men movie) allowed him to replace Bob Harras as Editor in Chief in 2000. 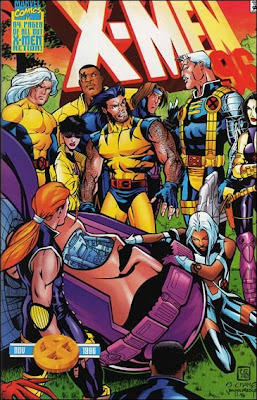 Joe Quesada once said that he couldn’t keep the various X-characters and their spandex outfits straight, a sign that he didn’t hold the numerous mutant characters in the same esteem Bob Harras (who had been editing various X-titles since the ‘80s) did. The X-franchise still holds weight, or else Marvel wouldn’t be publishing so many spinoffs, but the commercial appeal has obviously dwindled under Quesada. The majority of the titles are now mid-level books that turn a profit and have a fanbase, but don’t set the sales charts on fire. 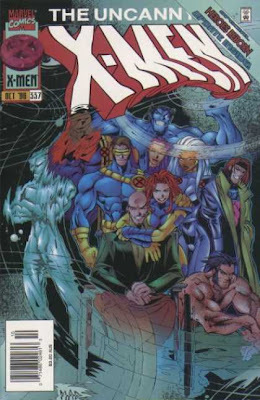 It’s common to see low-selling X-books cancelled these days, which would’ve been unthinkable during most of the ‘90s. Without the commercial success of “Heroes Reborn”, and the Onslaught storyline that preceded it, it’s conceivable that the comics landscape would look very different today. Summary: Joseph tells Captain America the story of Dr. Doom’s arrival in New York. He asks why Doom is helping out, and Captain America responds that he’s making sure the Earth exists so that he can rule it one day. Meanwhile, Onslaught tries to absorb X-Man’s powers, but he manages to resist. Onslaught reads his mind, and is angered when he learns that the mutants who ruled X-Man’s world also destroyed it. He then absorbs X-Man into his body, forcing him inside with Franklin Richards. Xavier secretly leaves the rest of the heroes to personally confront Onslaught. Onslaught destroys his wheelchair, and tells him that neither humans nor mutants are fit to rule, so everyone must be destroyed. Continuity Note: Onslaught claims that his minions, such as Holocaust, Post, and Havok, served their purpose and brought him X-Man. No, they didn’t. Onslaught captured him personally in X-Man #19. The only bad thing about this is that it happened after convention season was over. Otherwise, the entire freelance community would be drinking on me all summer long. Review: It seems that quite a few of these tie-in issues mainly consist of the heroes talking to each other while they’re waiting for their next strike on Onslaught. Waid handles Joseph’s conversations with Captain America and Xavier well, but eventually you just want the heroes to stop standing around and do something. There is a fun scene that has Dr. Doom (incredibly rendered by Kubert) destroying a Sentinel with one blast, which serves as a reminder that the story at least had some potential, even if it’s just seeing the various Marvel characters united against a common foe. The story of Onslaught himself is advanced here, and not for the better. X-Man’s ability to resist Onslaught is played up for the first few pages, but suddenly in-between pages, Onslaught is able to casually absorb him with no explanation. The knowledge he gains from X-Man shifts him from a “mutants must rule” motivation (which wasn’t even clear in his previous appearances), to a nihilistic “kill everything” goal. This is just boring judged on its own merits, but knowing that Lobdell had actually given him a far more coherent motivation (reprinted in the Road to Onslaught special) makes it seem even worse. The original idea, which exaggerated Xavier’s goals and had Onslaught forcing everyone into a peaceful Collective Intelligence, at least is a logical progression of Xavier’s way of thinking. Abandoning that idea, which never even made into any of the actual stories, and just turning the villain’s plot into “everything must die” is horribly misguided. I have no idea what was happening behind the scenes during this era, but after Onslaught reveals himself, the stories aren’t given anywhere to go. Onslaught sends Sentinels to attack New York and the heroes respond, but this is just followed by issues of Onslaught in his citadel threatening Franklin Richards. He doesn’t do anything once he emerges, and none of the stories ever gets around to explaining why exactly he’s attacking New York. I know that the Onslaught storyline was hijacked in order to provide an in-continuity reason for the Fantastic Four and Avengers to disappear (as the characters had been outsourced to Rob Liefeld and Jim Lee), but I don’t see how that precluded anyone from writing a few lines of dialogue to clarify the villain’s motives. Now that the storyline is drawing to an end, it seems as if the creators have given up on any legitimate motivation for Onslaught, so now he just wants to kill everybody. Punisher #11 (Ostrander/Lyle/Jones/Starkings/Comicraft/Kalisz/American Color) – Another tie-in that has nothing to do with Onslaught. SHIELD investigates the arrival of Sentinels in Manhattan, which leads to their helicarrier getting shot out of the sky. The Punisher witnesses the event and reluctantly dives into the river to rescue the survivors. He aids G. W. Bridge against a street gang that’s jumped on board to loot the helicarrier, and then agrees to take down a mutant terrorist group while SHIELD deals with the situation in Manhattan. This is a straightforward action story, and it’s executed rather well. The actual effect of Onslaught’s electromagnetic pulse attack hasn’t been portrayed very consistently throughout the tie-ins, or internally within this issue (SHIELD agents are forced to use hang gliders, yet the helicarrier can remain in the air, and the gangleader’s jetski still works), but that’s a relatively minor nitpick. I’m not sure what exactly Marvel was doing with the Punisher during this period, but I seem to recall this series opened with him working (presumably undercover) as a mob boss. With a ponytail. It never seemed that promising to me, but Ostrander does show a strong handle on the character with this issue (and his hair is back to normal). The Punisher’s narration is often humorous and the action moves at a steady pace. I wasn’t expecting much, but it’s an inoffensive action story. Spider-Man #72 (Mackie/Romita, Jr./Williamson/Starkings/Comicraft/Tinsley/Malibu) – Well, it’s an entire issue of Romita, Jr. drawing Spider-Man fighting Sentinels, so it can’t be all bad. At this point in Spider-Man’s continuity, Peter Parker believed that he was a clone and that Ben Reilly was the true Spider-Man. Peter scientifically removed his spider-powers, in the hopes that he could retire and have a normal life with his pregnant wife. Behind the scenes, Marvel decided that the story had gone too far and that Ben Reilly couldn’t remain as Spider-Man. So, shortly after Peter’s powers were gone, they began to sporadically reappear (I’m basing this on my memories of the Life of Reilly serial). Now that his powers are gradually coming back, Peter's a target for the Sentinels, while Ben Reilly tries to protect his cloned “brother”. The two spend the entire issue fighting Sentinels with each other, contributing essentially nothing to the Onslaught story, or any of the storylines in the Spider-titles. Mackie’s script has its share of clunky dialogue and corny jokes, but the story manages to keep moving and rarely feels repetitive, even though the plot’s razor-thin. #17 (Lobdell/Lee/Bachalo/Buckingham/Comicraft/Buccelato/Malibu) – Chris Bachalo returns with this issue, as Scott Lobdell is inspired to insert Stan Lee as the issue’s narrator. Lee wrote his own dialogue for the issue, so he gets a co-writer credit. The idea of Stan Lee as a cartoony narrator will show up a year later in Marvel’s “Flashback Month” gimmick, which isn’t surprising since his appearance here is fun (and not what you would expect from a Marvel comic in this era). The story mainly focuses on Skin evading the X-Cutioner, who irrationally thinks that he killed Angelo Espinosa and took his identity (in fact, Skin is Angelo). X-Cutioner’s justifications for targeting “killer mutants” have been shaky in most of his appearances by this point, and Lobdell uses this as an actual plot point as Skin engages in psychological warfare against him (I wonder if this was always the plan, or if Lobdell just realized while writing the story that the premise was weak). Bachalo returns with an altered art style, which seems to deviate from his previous look even more as the issue progress. Not only is the style cartoonier, but almost all of the figures are smaller, as they’re packed into layouts that often have a dozen or more panels per page. Bachalo was experimenting with smaller panels earlier in the series’ run, but he always managed to keep the pages attractive and neat. Now, several of the pages just look cluttered, and the storytelling is often unclear. Even Stan Lee jokingly reminds Bachalo that he isn’t paid by the panel in one scene. As the designs are becoming more simplified, the cast seems to be developing more generic faces, and a manga influence begins to creep in (Banshee suddenly looks 20 years younger and has a spiky hairdo). I certainly wouldn’t say that this is a bad-looking comic, but I prefer Bachalo’s earlier, less-cluttered work. #18 (Lobdell/Bachalo/Buckingham/Comicraft/Buccelato/Malibu) – This is labeled an “Onslaught” tie-in on the cover, although that’s a stretch. Emma Frost senses “something…bad” that could harm the students (we’re only told in a footnote it’s Onslaught), so she conspires to hide them in Canada. Lobdell has Emma use her powers in creative ways, as she tricks Banshee into abandoning their plane, and easily fights the team when they realize she’s abducting them. She then puts them in a happy haze to keep them complacent. Lobdell keeps her motives a mystery until the end of the issue, playing up her criminal past and giving the cast legitimate concerns that she’s been duping them all along. Skin and Chamber’s storyline continues, as they sneak a ride with a trucker to New York. Chamber’s powers are acting strange since his brief encounter with Onslaught (which occurred off-panel in X-Men #49), which is awfully convenient since his crossover has officially begun in the other titles. Two more subplots are introduced back at the team’s Massachusetts home. One has Mondo making cryptic comments to himself, and the other involves the new groundskeeper, Chevy. It’s hinted that he was in the mob that killed Dennis Hogan (in X-Men Prime), and has been sent by his father to hide out at the school. This requires Chevy’s father to know Banshee personally, but not know that he’s a mutant running an all-mutant school. All of these elements combined are a lot to swallow, but this is an interesting way to follow up the Dennis Hogan story. I seem to recall people listing this as a dropped storyline, though, which unfortunately wouldn't be surprising. There are quite a few things going on in this issue, which is something I always enjoy in team books. Bachalo’s art isn’t as chaotic as the previous issue, and Lobdell does a decent job handling the various plotlines. 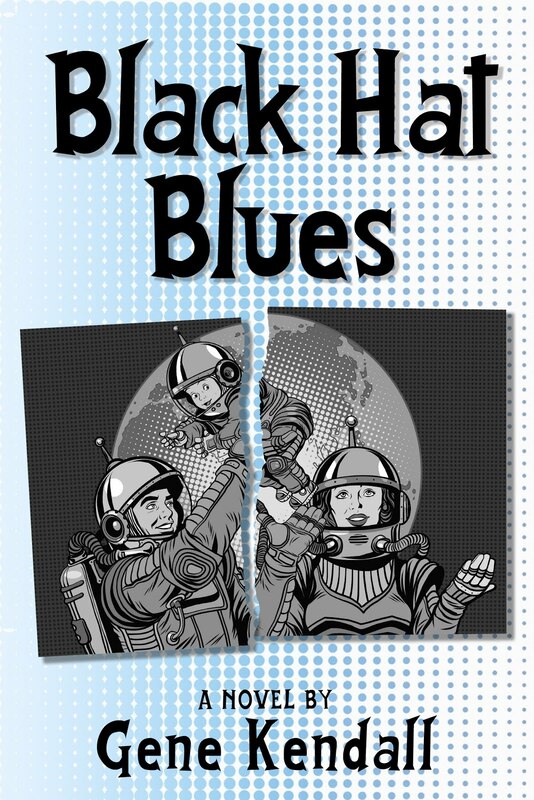 #19 (Lobdell/Bachalo/Buckingham/Comicraft/Buccelato/Malibu) – I think this is the only comic with an “Onslaught” tag on the cover that goes for comedy. It’s revealed that Emma Frost is psionically affected by Onslaught’s existence, so she’s responding in a daze to her subconscious desire to protect the Gen X kids. This somehow leads to the team dressing in goofy outfits, which makes no sense and doesn’t contribute to the story in any way. Lobdell gets some humor out of Emma’s pathetic attempts at domestic life, while Toad emerges in the background as the issue’s villain. This is also played for laughs, as it’s later revealed that Emma let Toad stay at her home after he was laughed out of the Hellfire Club when he applied for membership. Toad plans on using another one of Emma’s houseguests, a vaguely defined mutant named Surgeon, to force the students into becoming his slaves. M subconsciously contacts Emma and breaks her out of her spell, allowing Emma to confront Toad and give him a stern lecture that forces him to retreat. Meanwhile, Banshee and Sasquatch team up to find Gen X, as the story makes numerous jokes at the expense of Alpha Flight (I guess not enough time had passed for ‘80s nostalgia to really kick in). This doesn’t really go anywhere, as they conveniently locate the team right after Emma returns to normal and chases off Toad. The story is obviously fluff, but I found myself enjoying it. Like many of the other titles, it’s killing time during the crossover, but it does so in an entertaining way. Summary: Excalibur returns from their mission in London and learns from Moira MacTaggert that Charles Xavier has gone mad. Onslaught’s EMP attack is keeping planes out of the air, preventing the team from flying to New York. Captain Britain suggests taking their medical craft to the outskirts of New York to provide medical care, but Nightcrawler tells him that it was damaged by Black Air. As the team reacts to Xavier’s transformation, Alistaire Stuart receives word that Black Air has been shut down. He’s been offered directorship of a new department that merges W.H.O., Black Air, and all paranormal research. He offers Rory Campbell the role of Mutant Liaison, which requires him to move off Muir Island. The team watches news reports about the blackout in New York, and tries to think of another way to help. Moira tells them that they are the last hope for Xavier’s dream, and demands that they stay away. Continuity Notes: Captain Britain tells Peter Wisdom that his vision of the future that had Excalibur killed by Black Air couldn’t happen now, and it’s because Wisdom chose to join the team in this timeline. He also tells him that his visions of the future have stopped, inferring that all of them were visions of a reality where Wisdom never joined Excalibur. According to Captain Britain, Wisdom has to tell Kitty he loves her to make sure the future is altered. Review: As the title implies, this is a “quiet” issue, which mainly exists to have the cast react to major events and finish up a few storylines. Black Air is dissolved off-panel, and Alistaire Stuart is returned to his previous status quo (although I’m sure Black Air has shown up again over the years). Rory Campbell gets a quickie resolution to his arc, as he’s suddenly given a job elsewhere that allows him to help mutants. This doesn’t work at all, since discovering and aiding new mutants gives Rory just as many opportunities to disdain them (and later become Ahab) as working at Muir Island would. The idea that Peter Wisdom’s presence on the team stops all of Brian Braddock’s visions of the future is also odd. The original idea had Braddock seeing visions from across the entire timestream. Claiming that just one character’s presence changes everything and cures Braddock of his visions elevates Wisdom to a ridiculously lofty position. Ellis handles the team’s reaction to Onslaught well enough, although it seems like he’s stretching for a reason not to bring the Excalibur cast to New York. If the heroes really wanted to help out their friends, they would’ve found a way. The real reason why they aren’t helping is because Excalibur wasn’t scheduled to fully cross over with the other titles during the event. Why exactly I’m not sure, since the Demon in London story could’ve been shortened and the team brought to New York with everyone else, if that’s the way Marvel wanted to play it. Maybe someone still cared enough about quality to give Ellis room to finish his storyline comfortably and have it conclude with the anniversary issue. Even if the story has to find excuses to keep the team away from Onslaught, I am glad that this title didn’t have to waste an entire issue fighting Sentinels in New York, or crafting futile plots with the other heroes. It’s interesting that Ellis explicitly states that half a million died in London during the demon’s attack, but the other X-writers refuse to acknowledge any casualties in New York during the Onslaught incident. In fact, one previous issue of the storyline even outright said that no one has died yet, thanks to the work of the heroes. This is of course absurd, as we’ve seen an electromagnetic pulse shutting down power across the city, Sentinels inciting panic in the streets (even if they’re only targeting superhumans), and numerous fires. It’s amusing that Ellis gives his storyline a massive body count, but his more traditional American counterparts won’t list any casualties. As we’ve seen over the years, Ellis’ darker, British sensibilities have prevailed in mainstream comics. Summary: Dr. Strange senses a mystical disturbance and arrives at the X-Men’s mansion. He uses the Eye of Agamotto to witness Onslaught’s recent imprisoning of Juggernaut inside the Crimson Gem of Cyttorak. Gomurr the Ancient arrives, telling Dr. Strange that they can’t leave the Crimson Gem unguarded. He asks Strange to protect the Gem while he goes inside it to rescue Juggernaut. Inside the Gem, Juggernaut is trapped in another dimension. The demon Spite, posing as Xavier, is taunting him. Gomurr arrives and forces Spite to reveal herself. She leaves, bragging that her master will soon claim Juggernaut’s soul. Gomurr tells Juggernaut that he can show him the way out of this dimension, but he must face his past first. Juggernaut is forced to revisit his childhood with his hated stepbrother, Charles Xavier. Gomurr tells Juggernaut to let go of his anger and be free of his curse. Spite reappears, offering Juggernaut a chance to embrace his power and escape the Gem. She convinces Juggernaut that Gomurr just wants the Crimson Gem’s power for himself, and takes him to met Cyttorak, the god of destruction. Juggernaut soon learns that Spite only intended to use him as a sacrifice to Cyttorak. Cyttorak swallows Spite and prepares to consume Juggernaut. The mystical Tar appears and joins forces with Gomurr. They infuse Juggernaut with the energy that bonded Cyttorak to the Gem, which gives him the power to destroy the god. Juggernaut escapes the collapsing dimension and reemerges in the real world. To Dr. Strange’s dismay, Juggernaut declares that he’s stronger than ever. Continuity Notes: This is the first appearance of Spite, who is D’Spayre’s sister. Gomurr claims that D’Spayre trapped her inside the dimension with the Crimson Gem of Cyttorak. An origin for the Gem is revealed (although the continuity surrounding Cyttorak seems to be confused). Centuries ago, “a group of heretic monks” sought to harness Cyttorak’s energy. They instead unleashed his destructive energies, which destroyed parts of Asia. Gomurr and Tar used their mystical powers to contain Cyttorak within a ruby. Disagreeing on who should keep the powerful gem, they buried it in a temple hidden in a cave and sealed the entrance with a mountain of rocks. Years later, earthquakes opened the entrance to the cave, allowing Cain Marko to discover the ruby and become Juggernaut. Review: This is labeled as part of the Onslaught crossover, although it’s actually a follow-up to one of Onslaught’s actions and not a part of the real story. I’m sure every X-title had to tie in with Onslaught in some way, and this is how the oft-forgotten Unlimited got dragged into it. I’m not sure what the point of the story is supposed to be, outside of freeing Juggernaut up so he can be used again, and incorporating some of the newer characters into the Crimson Gem’s origin (personally, I think the Beast/Dark Beast story should’ve been resolved here, instead of X-Factor, where it arbitrarily ended up). Moore only briefly teases the idea that the Juggernaut might change his ways before he goes back to behaving like a giant thug. The ending, which essentially rewards Juggernaut for his bad behavior, is at least a small twist. Juggernaut has a chance to reflect on his mistakes and learn something, but decides he wants to be strong and nasty anyway. He’s adamant about not learning anything, and escapes any real repercussions for his stubbornness. It’s mildly amusing, although Moore doesn’t play it for laughs. The Juggernaut can be a hard character to pull off, especially as a story’s protagonist, as his main motivation is that he irrationally hates his stepbrother. Moore does manage to make Juggernaut engaging enough to follow throughout the story, although it feels like it goes on for a little too long. Epting’s art is solid as usual, and he draws a convincingly powerful Juggernaut. Olivetti’s rougher style doesn’t blend well with Epting’s, but most of his pages appear as fantasy sequences, which works out pretty well. Incorporating Gomurr and Tar into the Gem’s origin feels surprisingly organic, even though they were very new characters at this point. I think it works because there aren’t many mystical characters in the X-Men’s corner of the Marvel Universe, so it doesn’t feel like a totally arbitrary connection (unlike, say, connecting Dark Beast to the Morlocks or Sugar Man to Genosha). The remaining ten pages of the issue consist of filler like a crossword puzzle, brief “interview” segments with various characters, quotes from previous issues, a “match the mutant” puzzle, and an extended letters column. In fairness to Marvel, the price has been dropped a dollar to make up for the downgraded paper quality, but it’s still obvious that this book serves no real purpose. Green Goblin #12 (DeFalco/Hood/Fisher/Novak/Wright) – This is a very old-school superhero story starring Phil Urich, the short-lived “slacker” hero Goblin. Like many of the crossover issues, the Onslaught storyline is simply used as a setup for having the hero fight Sentinels. In this case, Green Goblin faces off against just one Sentinel, and spends several pages before the fight debating over whether or not to even get involved. The Goblin predictably overcomes his fears and defeats the Sentinel, but the story does acknowledge that his victory is ultimately futile, and the battle also damages the mask that gives him his powers. 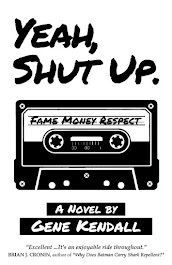 It’s capably written by DeFalco, although the hip, young dialogue is occasionally grating. The art is a goofy McFarlane/Madureria pastiche, which also dates the book badly. Incredible Hulk #445 (David/Medina/Riggs/Starkings & Comicraft/Oliver) – The Hulk and a few of the Avengers launch a failed attack on Onslaught, in a story that could’ve come across as pointless time killer, but David manages to pull off. As Hulk and the Avengers approach Onslaught, he creates a mental illusion of a fight where Hulk defeats him, but only after his allies are killed. Onslaught connects everyone to the Hulk’s mind, revealing that Hulk’s concern for his partners’ lives is overshadowed by his joy in defeating Onslaught. It reinforces the Avengers’ belief that the Hulk really is a heartless monster, which is exactly what he was trying to disprove. David makes the futility of their mission an actual plot point, which is one creative way to deal with an intrusive crossover. Fantastic Four #416 (DeFalco/Pacheco/Comicraft with numerous inkers & colorists) – The final issue of the original series, as it is relaunched by Jim Lee a few months later. DeFalco continues to wrap up the dangling plot threads from his run, while using the Onslaught storyline to provide villains for the team to fight. One of the subplots, a “real world issues” storyline involving Cassie Lang discovering that her friend is being abused, is resolved in just a few lines of dialogue. DeFalco knows his time is up, so he dedicates the majority of the double-sized issue to a giant fight scene with various FF villains. The setup is that Franklin Richards is sending a mental call for help to the team, and Onslaught is twisting his message and using it to create psionic projections of various villains. Some of the FF’s allies, including Namor and the Inhumans, show up to help. Dr. Doom even arrives, and agrees to join the fight against Onslaught. It’s a reasonable way to end a long-running series that has to dedicate its final issues to an outside crossover. There’s no way this could actually please dedicated FF fans, who didn’t want the continuity rebooted by Jim Lee and certainly didn’t want the last issue of this series to be a part of an X-crossover, but DeFalco does what he can. And it is nice to see Carlos Pacheco’s interpretation of the Fantastic Four’s entire rogues gallery. Iron Man #332 (Kavanagh/Bennett/Dzon & McKenna/Felix/Kalisz) – And here’s the final issue of Iron Man’s first volume. While Fantastic Four’s final issue at least made some effort to acknowledge the title’s history, Iron Man is content to fight Sentinels with the Avengers for the entire issue. The nominal plot has Iron Man making his way to the Wakandan Consulate so that he can gain access to the Black Panther’s vibranium supply, which he’ll use to finish the anti-Onslaught psi-armor. This is the teenage version of Tony Stark, who replaced his older, adult self a few issues earlier. This was a last ditch effort on Marvel’s part to revive interest in the title, which backfired to the point of becoming an industry joke for years (Kurt Busiek didn’t even seem that interested in explaining how exactly Stark returned to normal when he eventually took over the title). Summary: Cable and the Invisible Woman combine their powers to protect the heroes from Onslaught’s psionic assault. Apocalypse suddenly appears, telling Cable that he can separate Franklin Richards from Onslaught if Cable grants him access to the Astral Plane. The Invisible Woman convinces Cable to go along with the plan. Cable and Apocalypse soon travel though the Astral Plane and arrive inside Onslaught’s citadel. Onslaught attacks them with psionic projections of Magneto, Hulk, and Post. While Cable fights them off, Apocalypse approaches Franklin Richards. He reveals that his plan to separate Franklin from Onslaught is to simply kill him. The Invisible Woman, who has been telepathically shielded by Cable, emerges and fights Apocalypse. Onslaught uses his powers to send the trio back to the streets, leaving Franklin in his custody. Apocalypse teleports away, as Cable comforts the Invisible Woman. Inside Onslaught, Franklin is inspired by the heroes’ actions and has his hope renewed. Creative Differences: Some of Cable’s word balloons on page four have been poorly re-lettered. I don’t know if this was an actual dialogue change or some last minute typo correction, since his dialogue (about being the son of a hero like Franklin) fits in with the conversation he’s having on the rest of the page. Review: It’s another issue of large panels and big action scenes that don’t really accomplish anything. I like Churchill’s interpretation of Apocalypse, and it seems like his art is improving overall during this run of issues, so at least it’s not bad to look at. The story doesn’t stand up to a lot of scrutiny, as it’s unclear which scenes are supposed to be in the Astral Plane, and which are supposed to be in reality. It’s possible that the entire fight with Onslaught takes place on the Astral Plane, but that seems unlikely as a transition caption clearly states that Onslaught is in the real world, one page before Cable and Apocalypse arrive. Plus, the word balloons drop the special effect used for telepathic communication once they enter Onslaught’s citadel. It’s possible that Loeb intended that Cable and Apocalypse used the Astral Plane to teleport from the streets to the inside of the citadel, but that would contradict every other appearance of the Astral Plane that I’m aware of. (When X-Man pulled Xavier’s physical body out of the Astral Plane, it was stated that only X-Man was powerful enough to do this. It was also treated as a huge deal, while this issue doesn’t portray their journey as anything special.) I finally realized what Loeb was probably trying to convey – that Onslaught sensed their mental presence and pulled them out of the Astral Plane into reality. If Onslaught is supposed to be as powerful as X-Man, that would at least work with past continuity, and it’s preferable to making the Astral Plane a quick teleportation gimmick for telepaths. Whichever is the case, the ambiguity is annoying. Overlooking the shaky plot, Loeb does create a few decent character moments. Forcing Cable to team up with Apocalypse, his most hated enemy (now that Marvel’s forgotten about Stryfe) is an obvious way to go, but the interaction between the characters is fun. In one surprising scene, Apocalypse even offers to rid Cable of the techno-organic virus after Cable brags that it’s making him stronger. We also see Apocalypse’s reaction to Franklin Richards, which is something that would’ve happened years earlier, if the X-franchise hadn’t been so segregated from the rest of the Marvel Universe for so long. Apocalypse wants to kill him not only to depower Onslaught, but also to prevent him from disrupting his own plans. If Apocalypse was willing to infect Cable with a deadly virus as an infant, it makes sense that he would also view Franklin as a threat. 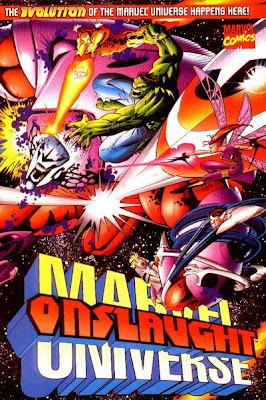 I barely remember anything from most of the Onslaught crossover issues, but I do remember enjoying the reconnection of the Marvel Universe, even if it didn’t last. Summary: X-Man awakens inside Sinister’s lair, while the Marauders’ Arclight and Scalphunter taunt the captive Threnody. Sinister explains that he was able to penetrate X-Man’s mind after he unlocked Threnody’s psi-restraints and entered her mind. 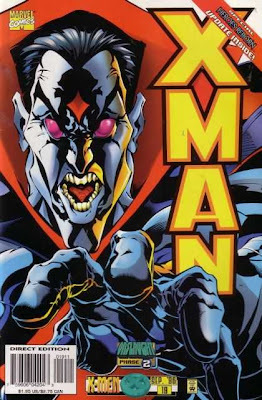 Sinister shows X-Man images he scraped from Bishop’s mind of the Age of Apocalypse, and tells him that there is now a threat worse than Apocalypse. Meanwhile, Onslaught forces Franklin Richards to send a telepathic call for help to X-Man. When X-Man senses the message, Sinister tries to prevent him from leaving. X-Man breaks free of Sinister’s restraints, and sees a mental image of Franklin. He reaches out to Franklin, whose form suddenly shifts into Onslaught. Onslaught grabs X-Man and takes him away. Meanwhile, Threnody kills a rat and uses its "death energy" to escape her shackles. She’s confronted by Arclight and Scalphunter in the sewers. Suddenly, a large mystery figures appears behind them. Continuity Notes: Sinister’s ability to shut off X-Man’s powers (in X-Force #57) is described as a “one-time trick”. X-Man claims that his brain has already rewired itself to prevent it from happening again. Threnody is apparently aware of Gambit’s past with Sinister, telling Scalphunter that “the Cajun” might save her. Review: This issue was referenced in quite a few of the Onslaught crossover chapters at the time, and I’ve always wondered what happened in this issue that was so important. Now I know -- Onslaught takes X-Man away from Sinister, all in the course of about four pages. Okay. The majority of the issue simply consists of X-Man yelling at Sinister, while Sinister keeps telling him what a great weapon he is. Actually, what exactly Sinister wants to do isn’t clear. If he wants X-Man to voluntarily join him in fighting Onslaught (even though last issue it was Apocalypse he was worried about), he’s not particularly charismatic. If he has some means of brainwashing him, there’s never any indication. The dialogue is never that interesting, but Skroce brings a lot of energy to the pages, which helps to liven things up. The alternating scenes with Threnody are less dull, and actually offer a small amount of characterization for Scalphunter and Arclight. Believing that Onslaught really is the end of everything, they decide to have an “out with a bang” fling. At first, it seems as if they’re going to have fun right in front of their prisoner Threnody, but things are brought back to a PG level when it’s revealed that they actually went into another room to finish. As strange as it sounds, it’s probably the closest thing to real human emotion the issue presents.